Entries are now closed, and the winners have been selected (thanks to Random.org) and contacted via email. If you're a lucky winner, please reply to the notification email within 48 hours so I can get your tickets to you! Also, if your circumstances have changed and you can no longer attend the show, please let me know so I can pass the tickets along to somebody who can. Thank you to everybody for participating, and maybe I'll see you next week at the Nashville Southern Women's Show! This one is mostly for the locals or those who live within reasonable traveling distance to Nashville. 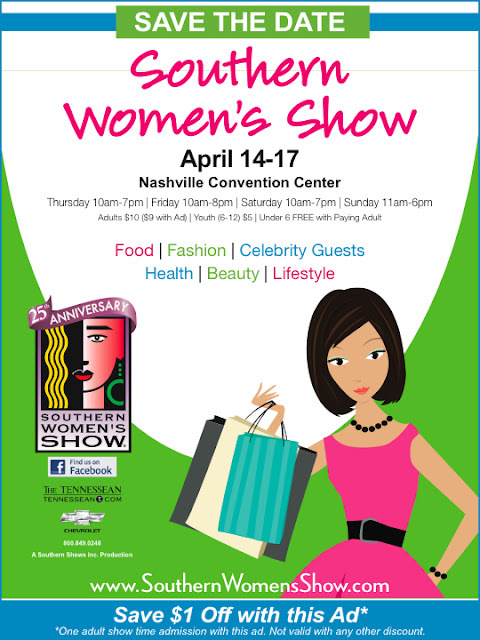 The 25th annual Southern Women's Show is coming to the Nashville Convention Center April 14-17 this year. That's right, this will be the 25th anniversary of the Nashville show! To celebrate, the first 25 visitors each day will receive a prize. Also, anyone who is 25 years old (must prove it with a valid driver's license) will get in free, and they'll be giving away $25 in "show bucks" every hour. Pretty cool, huh? But there's so much more... With over 500 exhibitor booths featuring all things of interest to women, including fashion, health, beauty, travel, boutiques, and other products and services, there truly will be something for everyone. Not to mention, several celebrity appearances are scheduled, including local cake decorator Jay Qualls who was a contestant on TLC's The Next Great Baker, as well as the winner of that competition Dana Herbert, who will be there on Sunday, April 17th. Radio host Dr. Josh Axe will also be there in addition to a beauty pageant winner or two and somebody else who will be giving make overs. Good stuff! I'm personally looking forward to the events. Like the Firefighter fashion show, live cooking stage, and test driving a Chevy Camaro or perhaps even the new Volt (don't tell my dad though, he's an avid Chrysler man). I'm also hoping to meet Jay and may even get up the nerve to ask him for a job. Okay, so now that I've talked it up, I'll get to the good part. Tickets are normally $10 each, but the awesome folks in charge of promoting the Nashville Southern Women's Show have graciously supplied me with TWENTY tickets to this year's event to give away! I'm giving the tickets away in groups of four, so you can attend all four days, go just one day and treat three friends, take your best friend to the show for two of the days, or however you want to use them. So, who wants to go to the Nashville Southern Women's Show? Just leave a comment on this post letting me know you want to go, and you'll be entered to win one of the five sets of tickets. Please also leave your email address so I can contact you if you're the winner. This is the mandatory entry, by the way. If you'd like to rack up some bonus entries, feel free to do any or all of the following, just be sure to leave a comment on this post for each entry so it counts. Visit the Southern Women's Show Nashville website and let me know something you're interested in seeing at this year's event. Like the Southern Women's Show Nashville page on Facebook. Leave a comment on the Southern Women's Show Facebook page. If you're feeling really generous, you could even mention that you're hoping to win tickets to attend from Darla's Cake Blog. Follow Darla's Cake Blog via Google Friend Connect (if you already follow, just leave a comment letting me know). Like Darla's Cake Blog on Facebook. This giveaway will end at 11:59 CDT on April 4th so I have enough time to get the tickets to the winners. FIVE winners will be chosen at random from all the comments using random.org. Please remember to leave your email address in your initial entry so I can contact you. Winners will have 48 hours to claim their tickets. Good luck! I blogged this in google too! My daughter and I live in Lewisburg, TN and we wouldn't think of missing the show. It is a family tradition. My little granddaughter who is 9 has never missed it and I heard her tell a friend last week that she even went when she was in her mommy's tummy. We love it. This will be our fourth annual “Mother Daughter Day Out” for my mom and me. I would love to win the tickets and take her every day. We always feel like we missed something. We love to watch everything on the cooking stage and of course we can’t miss the Fashion Show or the Firefighters. My email is jcarr108@comcast.net . Thank you for the opportunity!! Just left my comment on the Southern Women's Show Facebook page.....and you know I had to mention I am hoping to win tickets to attend from Darla's Cake Blog. 's Show! Great Ladies Day together! I liked the SWS facebook page! I commented on the SWS Facebook page that I'd like to win tix from Darla's Cake Blog! What a wonderful place to connect with women who are out there making it happen in the world, who believe in themselves and their dreams and are giving of themselves to serve hundreds of different needs of women and their families in the south. Liked both the FB pages and left a comment!! In the 5 years we've been here I've never been able to get there, I'd LOVE to go this year!! not sure if that showed up in the last post! !